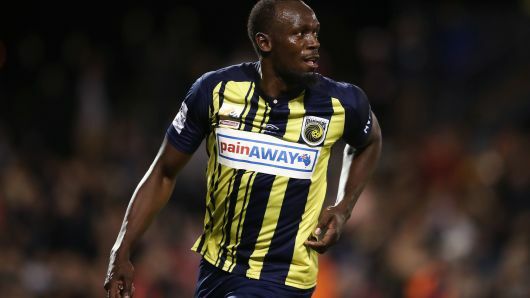 Usain Bolt celebrates scoring a goal for the Central Coast Mariners. Former Olympic sprint champion Michael Johnson has urged Usain Bolt to “find a passion” following the latter’s announcement that he has officially retired from sport. Bolt is an eight-time Olympic Champion and still holds world records in the 100 and 200 meter events, the latter of which he took from Johnson in 2008. However, after an unsuccessful attempt to forge a professional soccer career, the Jamaican has declared his “sports life over” and will now concentrate on a career as a businessman. Speaking exclusively to CNBC about his own post-athletic activities, Johnson said it is crucial Bolt finds something to keep him occupied. “I would advise anyone, whether it’s Usain Bolt or any other athlete about what to do after retiring — I think it’s about finding a passion.” Johnson told CNBC this week. According to Forbes Magazine, Bolt was earning upwards of $20 million a year mostly from endorsements before his retirement from athletics in 2017 and his biggest deal with sports brand Puma pays him more than $10 million annually. The charismatic sprinter has also recently moved into the restaurant business. His Jamaican-themed Track and Records establishment opened in the United Kingdom, with three sister venues in Jamaica. Former United States sprinter Michael Johnson attends the Samsung Champions Lounge during day eight of the 12th IAAF World Athletics Championships at the Olympic Stadium on August 22, 2009 in Berlin, Germany. Michael Johnson is one of a number of active and retired athletes who work with sports agency thinkBeyond Talent. The focus of the agency is to provide athletes with a voice on issues outside of sport. The organization has worked with two-weight world boxing champion Carl Frampton as well as Philadelphia Eagle’s hall of famer Brian Dawkins and Olympic climbing hopeful Molly Thompson-Smith. “I have long supported global organisations doing incredible work in communities through sport, but have often wanted to make more of a personal impact in the areas I care about the most,” Johnson said. Johnson’s said his young leaders program doesn’t exist to find “the next Michael Johnson”, but instead seeks to support young people from around the world who have shown the potential to be role models within their own community. thinkBeyond’s CEO Nick Keller told CNBC in January that the idea is to use sport as a tool to create positive social change. Elsewhere over the past year, other sports stars including basketball player LeBron James, tennis grand slam champion Serena Williams and NFL quarterback Colin Kaepernick have also spoken out about various social issues which are personal to them. Nike sponsored athlete Kaepernick has been called “one of the most inspirational athletes of his generation” by the sportswear brand, following his part in a 2018 advertising campaign. That capitalized on the former San Francisco 49er’s player using his platform to take a stand against what he believed to be social injustices towards black people in the United States.